I had a bit of moral dilemma earlier this week. The photo accompanying this post was taken by me at a coffee plantation near Antigua, Guatemala. The woman, a poor agricultural worker, was kind of enough to give me permission to photograph her at work. Now, an American coffee company has asked my permission to non-exclusively use this photo in some of their advertising products. Naturally, my hackles were up. Coffee is one of the most morally complicated products in the world; workers in the developing world toil under back-breaking conditions for pennies, while consumers in the North think nothing of dropping $5 or more on a single latte. 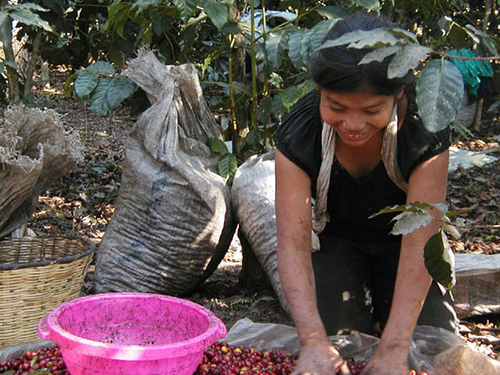 Corporations pocket the difference –a profit underwritten with the health of thousands of workers and resulting in the deepening enslavement of the indebted economies of the nations in which coffee is grown. But this company, Pangaea Organica, claims to be 100% Fair Trade and (less relevantly) 100% organic. I therefore reasoned that the good to be wrought from encouraging fair trade coffee outweighs the bad in allowing this woman’s photo to be used for commercial purposes, without me being able to ask her permission. I therefore gave them permission to use the image. Any comments from ethicists out there, professional or amateur? PS. I am not getting paid for use of the photo, except perhaps in the form of some free coffee. PPS. Use of this or any other of my photos in any commercial capacity without my explicit permission is prohibited!